Mike Clark began DJing at age 12. By high school, he was throwing his own parties and DJing in 21-and-up nightclubs. What began as a hobby was getting him booked for gigs and pushing other activities into the periphery. He was at the center of the techno movement and had to keep it spinning. "Electronic music truly changed everything I was planning to do in the future," he says. 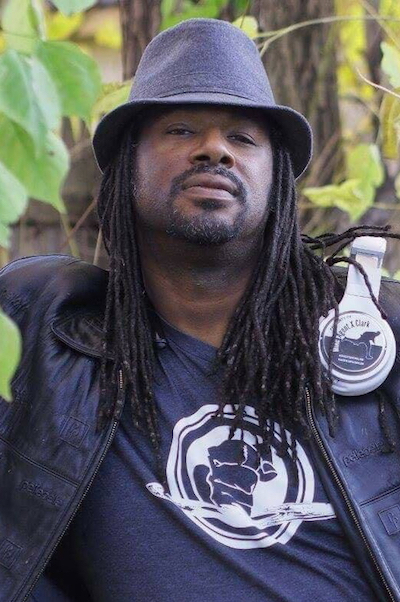 Clark, who makes music under the moniker "Agent X," frequently goes on tours to international venues and introduces a Detroit-cultivated sound to audiences all over the world. But the North End has kept him rooted in Detroit. That's where Clark grew up, and where his parents hung out with iconic Detroit greats like Diana Ross and Aretha Franklin. But he remembers a time when Detroit, and more specifically the North End, was a place that residents were raised to abandon. The goal was to grow up, get big, and leave the city in favor of places like Los Angeles, New York, or European cities where you could make a full-time living from techno. He tried it for a while, frequenting New York and playing overseas venues, but Clark prefers being surrounded by neighbors who know and care for him. "It's my roots, it gives me that familiar feeling. They're all about doing things with purpose," he says. The North End was once a place of astounding musical invention. Seminal Motown musicians grew up there and several venues hosted the world's great soul, funk, and blues acts. But it also has an important place in the history of techno music—and continues to today. On the surface, techno is an unlikely successor to Motown. The leap into a new, limitless sound signaled the end of the disco era and the beginning of club culture that was about new ideas as much as it was new sounds and dance moves. Techno was able to mimic Motown's local appeal and match it with a nearly instant, undeniably universal audience. The term techno was coined by Juan Atkins, the godfather of techno, to describe the electronic sounds he was making alongside his hometown friends, Derrick May and Kevin Saunderson. The group of teens, known as the Belleville Three, formed at Belleville High School and began making music together in the late 80s and playing it throughout Detroit's music scene. Sonically influenced by Kraftwerk, Parliament/Funkadelic, and radio DJ The Electrifying Mojo, techno music developed a very specific philosophy. 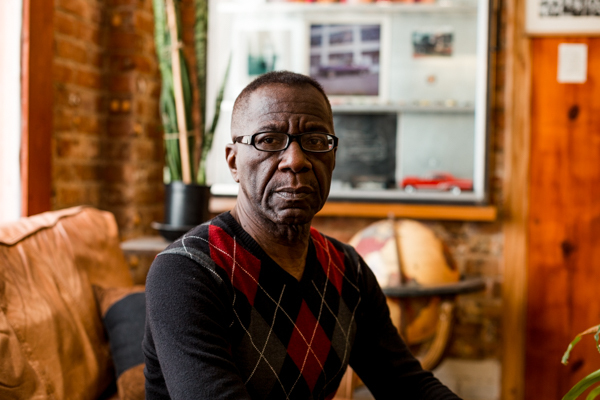 "Detroit techno is combination of influences that reflected what was going on in Detroit at that time," says John "Jammin" Collins, a DJ-producer at Underground Resistance. "It speaks to the music, it speaks to what black people were going through because black people made it, and it was also futuristic and optimistic." Collins was there from the beginning, collaborating with peers including Jeff Mills, Mike Banks, Mike Clark, and many other formative techno hard hitters. Together, they formed Underground Resistance, a music collective, along with Submerge Records, an operation that manages musicians, books gigs, and distributes music. 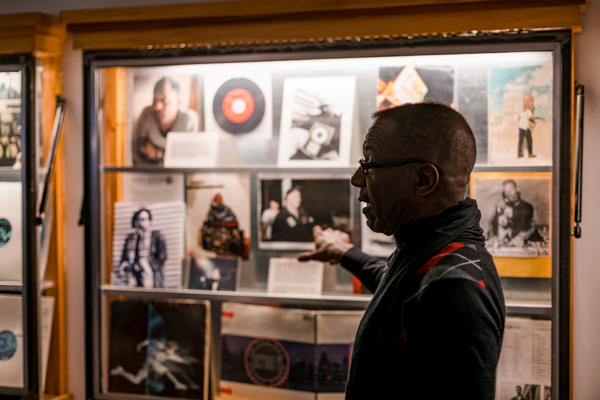 Most days, Collins is stationed at the Submerge Records headquarters in the North End on East Grand Boulevard, selling records and giving tours of the group's Detroit techno museum, Exhibit 3000, to intrigued visitors. He also hosts a biweekly radio show from Red Bull Radio's downtown studio. Submerge's four-floor building was once a UAW local and a rumored hangout of Jimmy Hoffa. Now, the basement is lined with records, merchandise, and a set of turntables so customers can enjoy their latest vinyl purchase. 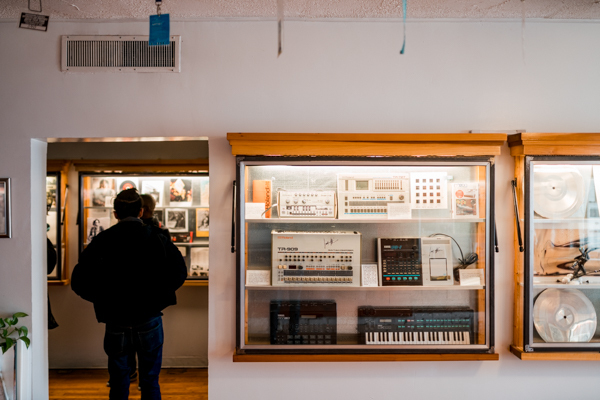 The main floor is part-studio, part-techno museum with archival images featuring Detroit's techno music pioneers and their spiritual and political influences. Clocks from cities around the world—Berlin, London, Detroit, Los Angeles, Tokyo—tick along the wall near the entrance, indicating its international appeal. When techno first got its start, the music had the indelible stamp of its origins—Detroit, radical politics, afrofuturism. But that changed once the movement left the confines of Detroit. "Once the world got a hold of it, they started making their own genres and sub-genres," says Clark. He pinpoints a specific DJ battle between musical collectives Direct Drive and Deep Space Soundworks as the point where techno was established as an important musical moment, when drum machines were incorporated into a live set for the first time. After that, the buzz for techno began to build. DJs who play electronic music are constantly tempted by their popularity overseas and are often lured by opportunities that they have to perform elsewhere. For some, the international booking requests come more frequently than opportunities to perform locally. Techno's formative influencers, like Clark and Collins, have chosen to stay in the city. As the birthplace of their first creative endeavors, the North End is still a source of inspiration. These techno pioneers describe Detroit in similar ways to techno—as a place with magnetic energy and pulsing possibility, strengthened by proximity, that cannot be pressed onto vinyl or streamed online. Nothing is as electrifying as standing and building on the city's funky, fertile ground. "I could've moved many many times," says Collins, "but I chose to stay because I never lost faith in the city and I knew that eventually, it would come back."